Unlike surgery, mechanical traction, and other invasive forms of treatment, using a Yoga Swing is a gentle, passive way to target pain at the source and care for all weight-bearing joints. This progressive form of traction allows each joint to be decompressed by the same weight that compresses it while upright. To put it simply, inverted decompression creates an ideal stretch that improves spinal health and targets back pain by helping to 1) rehydrate discs, 2) reduce nerve pressure, 3) realign the spine and 4) relax tense muscles. Best of all, decompressing on a Yoga Swing takes only a few minutes and feels great! Clinical studies show that when inverted the separation between the vertebrae increases, this allows for absorption of moisture into the soft tissue of the discs, increasing the nutrient content as well as plumping the discs for better shock absorption and flexibility. When you are sitting, standing, exercising, or doing other weight-bearing activities, fluid is squeezed out of your discs and into adjacent soft tissue, just as moisture can be squeezed out of a sponge. As a result, your discs lose some of their height. To prove this fact, measure yourself in the morning and then again at night. You will lose half-an-inch to three-fourths-of-an-inch in height by the end of the day. (To see this change you can measure your true height or measure your waist. Height loss can be seen in the size of the waist because although you are shorter your body mass is the same and therefore the ‘column’ of your body increases in diameter). When you are lying down the compression in the spine is reduced enough to allow the discs to slowly reabsorb moisture and nutrition over the many hours you sleep. However, the discs may not always maintain their full height capacity, creating a total accumulation of height loss of up to two-inches in a life-time. In fact, the only time in your life when you are giving your discs a break is when you are inverting. The Nachemson study  provides some insight: A number of volunteers permitted a pressure sensor to be surgically implanted inside the third lumbar disc. The pressure inside the disc in the standing position was set at a base line of 100% and all other body positions compared to it. Interestingly one of the most compressive activities for the discs is sitting. The muscles in the stomach and back relax, but the pressure in the spine increases. If you are sitting in poor posture the pressure in the lumbar can climb as high as 250%. The real surprise occurred while lying down. The pressure inside the disc only lost 75% of standing body weight – it never went below 25%! This residual compression seems to be due to the hundreds of ligaments and muscles that encase the spine, holding it in compression like a mass of rubber bands. This study further indicated that the amount of traction force required to overcome the compression was a large number, approximately 60% of your body weight.Inversion to an angle of about 60o is the only practical way to offset that much gravity force while remaining relaxed. (Hanging by your arms will not create the same effect since it requires muscles to be engaged, plus the weight of the legs are much less than that of the torso and therefore the traction gained is not enough to bring the pressure to zero). The height of the discs relates to the size of the passageway for the nerve roots to exit from the spinal column, so a plump hydrated disc creates maximum clearance, helping to alleviate any pressure or pinching of the nerve root. A bundle of nerves called the spinal cord run through the spine column; these nerves control communication from the brain to the rest of the body. Nerve roots exit between the vertebrae along the length of the spine in the passageway created by the discs. Damage to the discs or de-hydration/degeneration of the discs can result in nerve root entrapment, or what is commonly called a pinched nerve. Since the nerves extend into the body there can be pain that radiates into extremities. Through the increased hydration to the discs during inversion the discs plump in height, effectively increasing separation between the vertebras and reducing the pressure and pinching on nerve roots. So many of our daily activities lend themselves to misalignments and possible permanent postural changes; sitting at the computer with rounded shoulders, carrying a heavy bag always on one shoulder, even wearing high heels. Also, many of our most popular sports are one-sided and rotational, like golf, squash, tennis, which puts significant stress on the spine as well as develops muscles on a single side of the body. Misalignments mean that the body weight is no longer supported by an alignment of bones, and therefore the soft tissue of the body must resist gravity. Misalignments are not always felt on the inside but left alone they can cause visual changes to your posture, and those changes can be degenerative. If you want to test this as home, take an empty aluminum can and place pressure on the top. The can will be able to maintain its shape even with great force applied because the sides are in alignment, but add a small dent to the can and it will crumble under half the amount of pressure. When a vertebra is bumped out of alignment the ligaments and muscles that support the spine can hold it in misalignment through the compression that they generate. Since these ligaments and muscles are engaged even when lying down, creating pressure as much as 25% compared to 100% standing, it can be difficult for the spine to naturally come back into alignment. When inverted to 60o the pressure in the spine drops to zero, as shown in the Nachemson medical study, with the pressure off of the vertebrae and with some gentle stretching the vertebra has the opportunity to move back into alignment. Muscles are gently stretched as circulation is increased, helping to reduce tension. Stress and tension can cause pain and muscle spasms in the back, neck and shoulders, as well as headaches and other problems. Tense muscles can be attributed to misalignments of the spine, over stimulation of nerves, or poor removal of toxins by the lymphatic system and a lack of oxygen rich circulation. A study conducted by physiotherapist L.J. Nosse  found that EMG activity (a measure of muscle tension), declined over 35% within 10-seconds of inversion, the effect was found to start at the very shallow angle of 25 degrees. 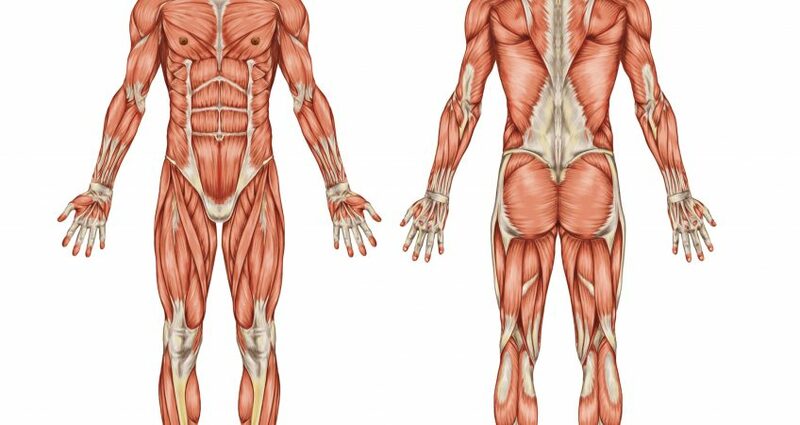 It is suggested that the stretch to the muscles while inverted allowed the circulation to enter the sore muscle, bringing oxygen rich blood inversion therapy also stimulated the lymph system to clear the muscle of the toxin build-up. The user therefore would feel a decrease in pain and the stiffness in the muscle would subside. As noted in previous sections, using a Yoga Swing also encourages re-alignment of the spine and decreases pressure on nerve-roots. 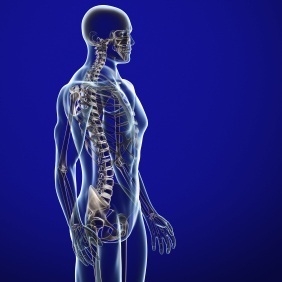 Dr. John E. Sarno, of the New York Institute for Rehabilitation Medicine claims that in more than 90% of the patients that he sees for back pain either there is no structural abnormality or the ‘abnormal’ x-ray does not really explain the nature or location of the pain. He calls the disorder the ‘tension myositis syndrome’ and describes how the tension causes muscle pain in this way: The muscle tenses and this reduces blood flow in the muscles of the neck, shoulders, back, or the buttocks. This produces pain by allowing the accumulation of waste chemicals, much the same process that causes leg muscle fatigue after a long run because of lactic acid build up. When the muscles goes into spasm in the lower back, it often leads you to believe (mistakenly) you have a disc problem. According to the book Better Back, Better Body  by Joanne Broatch: Much back pain is caused by muscles that are cramped, tense and in spasm. Using a Yoga Swing can help relieve this kind of pain [by relaxing muscles and clearing muscle congestion]… Using a Yoga Swing for inversions [stimulates] the flow of lymphatic fluid which flushes out the wastes and carries them to the blood stream. And the lymphatic system needs all the help it can get. Unlike the cardio-vascular system, the lymphatic system has no pump. Only the alternate relaxing and contracting of the muscles moves the lymphatic fluid through the capillaries and the one-way valves pointing towards the major lymphatic ducts in the upper chest. Even in healthy relaxed muscles, the lymphatic fluid moves very slowly… Where muscles are in spasm, the fluid does not move, the carbon dioxide and lactic acid remain in the muscles and you experience pain. Inverting, or tipping the body so that gravity works with, not against one way valves, helps the relaxed, expanding and contracting muscles to push the fluid up to the chest where it is then dumped into veins of the cardio-vascular system to be cleansed. Also, for centuries yoga practitioners have recognized the concept of turning the body upside down to find relaxation. The head stand position is a form of “postural exchange” (reversing the direction of gravity). Not everyone wants to do headstands, so inversion on Yoga Swing Hang Ups equipment creates an easier alternative with the added benefit of joint decompression. Mobilization and gentle loading of ligaments can help to increase the collagen content of the tissue, which results in increased ligament strength. Strong ligaments and muscles are vital for proper joint support, and help to protect against injury. Even the Army has utilized Yoga Swing EZ-Up Gravity Boots to mitigate joint fatigue injuries. Just as you brush your teeth every day to maintain your dental health, you should attend to the health of your spine with a healthy routine. There is no miracle for back pain; pills to cover up pain do not address the issue, and surgery is a last resort option. 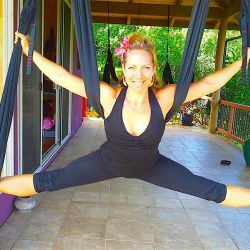 Yoga Swing is an affordable, natural, and easy to use piece of equipment that is backed by medical studies and endorsed by millions of people just like you. Tight muscles or stiff joints can also cause imbalances, which can result in improper body mechanics and an increased likelihood of injury. Using a Yoga Swing provides a natural stretch that gently elongates muscles and decompresses joints, enhancing muscle efficiency, and improving mobility and flexibility. Muscles adapt to bad posture. For example, with slouching shoulders the muscles in the chest shorten and those in the back lengthen. At some point is becomes to feels strange to stand properly. Inversion helps realign the spine and stretch the shortened muscles, many users report that they stand ‘taller’ and straighter after just a short inversion session. With continued use of the Yoga Swing you may experience permanent improved posture. Strong abdominals, internal and external obliques, and lower back muscles are vital for proper support of the torso. Crunches or sit-ups on Yoga Swing inversion tables is a challenging way to develop and define the core muscles. Spine extension is very important for posture and health. Since there is very little in life that we do bending backwards, taking time with exercise to move this direction can help keep our backs in balance. Ideally, every segment of the spine should move freely and easily in all directions. The real goal with good spine extension is to get the entire spine actively participating, which means the middle back has to learn how to extend – movement away from its natural curve. Practicing extension exercises also provides an opportunity to stretch and lengthen through the front of the body. In the long run this will help improve movement of the spine in all directions. Today back pain is one of the most common of all physical complaints in the world. 70 to 90% of men and women in the U.S. have had or will have at least one bout of incapacitating lower back pain. Back muscle pain contributes to lost work time and may cost as much as $100 billion annually (if lost productivity is included ). Each day, millions of people search for new ways to relieve lower back pain. Gravity is the culprit of most kinds of back pain; due to its compressive force the discs in the back lose moisture, like squeezing out a sponge the discs dehydrate and allow the vertebra to move closer to each other. This increases the chance of pinching nerves, decreases flexibility, allows for misalignment and restricts the disc’s ability to absorb nutrients. You don’t just feel this compression, it actually can be seen, in fact; the force of gravity is so powerful that it can result in two-inches of height loss by the time you reach seventy. What can be done to fight back against the long terms affects of gravity? One option is inversion therapy. Using a Yoga Swing at just the gentle angle of twenty degrees or as much as ninety for just a few minutes encourages the spine and weight bearing joints to decompress and rejuvenate. Just as you brush your teeth every day to maintain your dental health, you should attend to the health of your spine with a healthy routine. There is no miracle for back pain; pills to cover up pain do not address the issue, and surgery is a last resort option. Fortunately, there are some new studies coming out that show promising alternatives to back surgery. A preliminary study released by Newcastle University in England showed that patients who used a Yoga Swing over a period of time were 70.5 percent less likely to require back surgery for sciatica than patients who practiced more general forms of physical therapy. Unlike surgery, mechanical traction, and other invasive forms of treatment, using a Yoga Swing is a gentle, passive way to target pain at the source and care for all weight-bearing joints. This progressive form of traction allows each joint to be decompressed by the same weight that compresses it while upright. Reverse loading stimulates fluid and nutrition to the soft tissue of the joints, enhancing shock absorption and lubrication. Inverted movement encourages realignment and improves flexibility. To put it simply, inverted decompression creates an ideal stretch that targets back pain by helping to 1) rehydrate discs, 2) reduce nerve pressure, 3) realign the spine and 4) relax tense muscles. Rehydrate discs: Clinical studies show that when inverted the separation between the vertebrae increases, this allows for moisture to be absorbed into the soft tissue of the discs, increasing the nutrient content as well as plumping the discs for better shock absorption and flexibility. Reduce nerve pressure: The height of the discs relates to the size of the passageway for the nerve roots to exit from the spinal column, so a plump hydrated disc creates maximum clearance, helping to alleviate any pressure or pinching of the nerve root. Realign the spine: The traction applied also decompresses the spine to create an environment where misalignments can naturally fall back into place. Relax tense muscles: Muscles are gently stretched as circulation is increased, helping to reduce tension. The inner core of your discs is made of jelly-like material that provides the flexibility and “cushioning” in your back. When you are sitting, standing, exercising, or doing other weight-bearing activities, fluid is squeezed out of your discs and into adjacent soft tissue, just as moisture can be squeezed out of a sponge. As a result, your discs lose some of their height. To prove this fact, measure yourself in the morning and then again at night. You will lose half-an-inch to three-fourths-of-an-inch in height by the end of the day. (To see this change you can measure your true height or measure your waist. Height loss can be seen in the size of the waist because although you are shorter your body mass is the same and therefore the ‘column’ of your body increases in diameter). In fact, the only time in your life when you are giving your discs a break is when you are inverting. The Nachemson study  provides some insight: A number of volunteers permitted a pressure sensor to be surgically implanted inside the third lumbar disc. The pressure inside the disc in the standing position was set at a base line of 100% and all other body positions compared to it. Interestingly one of the most compressive activities for the discs is sitting. The muscles in the stomach and back relax, but the pressure in the spine increases. If you are sitting in poor posture the pressure in the lumbar can climb as high as 250%. The real surprise occurred while lying down. The pressure inside the disc only lost 75% of standing body weight – it never went below 25%! This residual compression seems to be due to the hundreds of ligaments and muscles that encase the spine, holding it in compression like a mass of rubber bands. This study further indicated that the amount of traction force required to overcome the compression was a large number, approximately 60% of your body weight. Inversion to an angle of about 60o is the only practical way to offset that much gravity force while remaining relaxed. (Hanging by your arms will not create the same effect since it requires muscles to be engaged, plus the weight of the legs are much less than that of the torso and therefore the traction gained is not enough to bring the pressure to zero). A bundle of nerves called the spinal cord run through the spine column; these nerves control communication from the brain to the rest of the body. Nerve roots exit between the vertebrae along the length of the spine in the passageway created by the discs. Damage to the discs or de-hydration/degeneration of the discs can result in nerve root entrapment, or what is commonly called a pinched nerve. Since the nerves extend into the body there can be pain that radiates into extremities. Through the increased hydration to the discs during inversion the discs plump in height, effectively increasing separation between the vertebras and reducing the pressure and pinching on nerve roots. In a recent article, Dr. Howard Loomis  discusses the importance of improving lymphatic drainage and explains the methods by which lymph moves. Not only does the stimulation of the lymphatic system occur by rhythmic muscle contraction, but it can also be assisted by venous pressure, respiration and gravity. Among his instructions for maintaining proper function of the lymph system, Dr. Loomis indicates elevating peripheral limbs as an additional method of stimulating lymphatic flow. Using a Yoga Swing inversion table [stimulates] the flow of lymphatic fluid which flushes out the wastes and carries them to the blood stream. And the lymphatic system needs all the help it can get. Unlike the cardio-vascular system, the lymphatic system has no pump. Only the alternate relaxing and contracting of the muscles moves the lymphatic fluid through the capillaries and the one-way valves pointing towards the major lymphatic ducts in the upper chest. Even in healthy relaxed muscles, the lymphatic fluid moves very slowly… Where muscles are in spasm, the fluid does not move, the carbon dioxide and lactic acid remain in the muscles and you experience pain. Inverting, or tipping the body so that gravity works with, not against one way valves, helps the relaxed, expanding and contracting muscles to push the fluid up to the chest where it is then dumped into veins of the cardio-vascular system to be cleansed. Nachemson, A and Elfstrom, G: Intravital Dynamic Pressure Measurements in Lumbar Discs. Scandinavian Journal of Rehab Medicine, supplement, 1970. Nosse, L.: Inverted Spinal Traction. Arch Phys Med Rehabil 59: 367-370, Aug 78. Loomis, H, et al: The Importance of Improving Lymphatic Drainage. The American Chiropractor 22: 14-18. 2000. Broatch, Joanne. Better Back, Better Body – The New Inversion Way. 29-31.Vancouver, BC: 1996. Jahnke, Roger. O.M.D., The Lymph. June 19, 2000. http://www.healthy.net/scr/Article.asp?Id=993. Sheffield, F.: Adaptation of Tilt Table for Lumbar Traction. Arch Phys Med Rehabil 45: 469-472, 1964. Gianakopoulos, G, et al: Inversion Devices: Their Role in Producing Lumbar Distraction. Arch Phys Med Rehabil 66: 100-102, Feb 85.